New modelling suggests more than 79 thousand tonnes of ocean plastic are floating inside the swirling mass of waste materials.in the northern Pacific Ocean. The study also found that microplastics are rapidly accumulating - from 0.4 kg per km2 in the 1970s to 1.23 kg per km2 in 2015. Researchers found that plastics made up 99.9 per cent of all debris - at least 46 per cent of the plastic consisted of fishing nets, and that over three quarters was debris larger than 5cm, including hard plastics, plastic sheets and film. 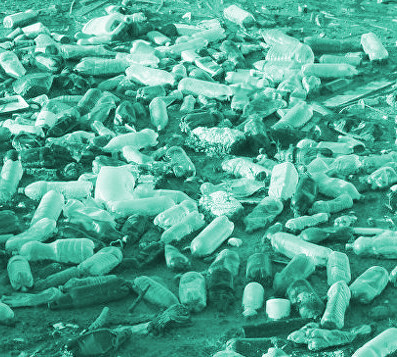 Microplastics were found to account for 8 per cent of the total mass of plastic. Although most large items had broken down into fragments, the researchers were able to identify a small number of objects, including containers, bottles, lids, packaging straps, ropes, and fishing nets. Fifty items in the sample had a readable production date: 1 from 1977, 7 from the 1980s, 17 from the 1990s, 24 from the 2000s and 1 from 2010. The authors assessed aerial images alongside data from 652 net tows carried out by 18 vessels. The aerial imaging allowed for a more accurate count and measurement of larger debris than previous studies that used only vessel-based visual surveys, which could partly explain why their estimates are higher than those made by other researchers. The differences between estimates could also be attributed to increasing levels of ocean plastic pollution in the area in the time since the previous studies were carried out, particularly following the 2011 Tohoku tsunami.